We headed West for Magdalena. We knew it would be a rough ride when we had to get three nails taken out of two tires. We pulled into the nearest pinchazo on the Inter-American. Crouched between towers of new tires we listened to the Olympic games over the radio. One hour later we were back on the road driving into the looming black rain cloud over Xela, our final destination. It was not as North as Chajul, but midway, intended as a mutual effort and crossroads by both Magdalena and us to get her what she needed. The air grew thinner and cooler as we climbed towards La Cumbre, what we call Alaska here – a place about as cold as any Guatemalan would be comfortable imagining. We slackened our pace. I was driving Bea’s dad’s truck and still hadn’t adjusted to the zero power steering, the broken fuel meter, no bearings, the lights in the dashboard not working, the four cylinders. Frankly, I hadn’t adapted to being in a car after the accident we’d had in Honduras the week before. But at 25 MPH and the hazards on I felt good about cutting through the dense fog one piece of asphalt at a time. We descended into Totonicapan, less than an hour from Xela and saw an older man sitting among the rocks with his thumb out. I looked at Bea to make sure she was comfortable with us stopping. She nodded. I reversed back to the giant limestone rocks where he had hidden four loads of wood about 60 pounds per load. He had a younger male friend with him, so that when we reversed we realized how much they’d been hauling up and down steep curves. They loaded up the truck and I swear I could hear the truck let out an “ufff”. They sat down on the side of the bed and whistled. We were moving slower than ever now, feeling the extra weight as I made our way up the hill in second gear, mile after mile. We must have driven 10 miles before the older man banged on the side of the truck, the universal sign for his stop. I looked at Bea and we both thought the same thing: That man was going to walk that entire way with those bundles. They offered to pay us for the ride, we thanked them and resumed our climb up the hill. Bea and I drove through the terrain like two old experienced truckers – staring off into the expansive landscape of jagged mountain rock, rising corn stalks, deep valleys and moist pine to the horizon. The light was fading quickly. We’d bought Magdalena’s sewing machine the week before after 72-hours of furiously fundraising $400 online, including the cost of transporting the machine westward to Chajul. I had rushed over with a big wad of quetzales, our local currency, in my two pant pockets and my shoes and made my way to Revue Magazine where Terry Biskovich was waiting for us. She ran a used clothing, book and brick-a-brac store in front of the Magazine office. The shop served as a way to raise funds for her animal shelter in La Antigua – the veterinarian for the shelter was our veterinarian. It was a small town for all of us. What was significant was that we were about to create a win-win situation for everybody involved. I had gotten the idea to ask her if she was willing to donate the Huskylock 905 Swedish sewing machine that had been at the store for months now with a handwritten $550 price tag cut out as a large dog paw print. She thought about it, told me she couldn’t donate it because she’d just rescued a horse, but she would reduce the price. She agreed to sell it for $400. We shook on it, she put the “SOLD” sign on it. The weekend before we bought it, Jose Osorio, Magdalena’s friend, had stopped by to catch us up on how the coffee cooperative was doing and the update on Magdalena and the other women. They’d met with various nonprofits that were willing to help them export their textiles as long as the women could produce the quantity needed for export. I asked him if that was possible for them. He said “No.” Why? Because they didn’t have the sewing machine to make it happen. How much was a sewing machine, I asked him. “I dunno, maybe $300?” And would it last long at that price? He looked at me puzzled and then shrugged his shoulders. “They’re Chinese machines,” he said. “They get the job done.” That’s when it hit me that we should show the Huskylock 90 machine to Jose and see what he thought of it. That same day I dragged him across La Antigua. We crossed the park hurriedly, I took him up the stairs and he hung back to look back at the machine from a distance. He saw the sewing machine and folded his arms around his chest and smiled shyly. “That’s a good sewing machine, why would someone give it up? Does it work?” All good questions, so we plugged the machine and asked the store clerk how often the machine had been used. “It’s been used once and then the owner realized it wasn’t what she wanted so she donated it to us.” Jose looked puzzled. “The signs says $550,” Jose said. I told him not to worry about that, we’d made an agreement among friends. Jose was thinking hard. “Are you going to buy that machine for them?” Jose said. I don’t have that kind of money, I told him, but I have a small amount of money and we know other people who have small amounts of money. “We’re going to buy that machine for them, together.” I’d done the same thing with my Tio Nefta’s House, in true “Eat Pray Love” fashion, and fundraised $3700 in less than a month, built my uncle the house and even a table and some furnishings for his two-room home. We could certainly fundraise $400, buy this machine and get it to Magdalena and the group of women who formed The Association of Displaced Maya Ixil Chajulense Women (ADMICH). We made it into Xela right before dark and as we parked in the hotel the rain started to fall steadily from the sky. We took out the large plastic containers we’d used to put the sewing machine and our bags to protect against the rain. We ran quickly into the hotel, unpacked and waited for Magdalena and Jose to call. Half an hour later they called from the central park in Quetzaltenango and made their way to our hotel room where we’d put the box with the sewing machine on the desk. We dovetailed our trip here with a screening of “Granito: How to Nail a Dictator” as well as, some testimonies from people of their memories during the armed conflict. Not a minute would be wasted. When I entered The Revue offices to pay for the machine, Bea, the other intellectual author of our crowdfunded sewing machine for Magdalena idea, stood in the middle of the room like Amelia Earhart, silk scarf tossed across her neck, her motorcycle helmet under her right arm. Her arms firmly on her waist as she waited for me. She was bigger than life and taller than most Guatemalans, including myself. “Do you have it?” She asked me. Yes, I do, I told her, I have the money. She looked triumphant and it made me smile. We’d met Magdalena months before when Jose made his usual exploratory rounds in Antigua, trying to find buyers for his organic coffee made in Xix, El Quiche. Jose I’d met through a training I’d done in August 2011 and since then I was his source for contacts and random ideas for his business. On one of this trips Jose brought Magdalena, a young 29-year-old woman with the most ernest smile and wearing the bold colors of her region’s traje against a black background fabric. I sat next to her on the park bench in La Antigua and she told me her story. She and her family, along with many other widowed women, had been displaced from their homes in Chajul during the armed conflict. They’d lived along the northwestern border with Mexico until they were allowed to return, many of them carrying the only things they owned. 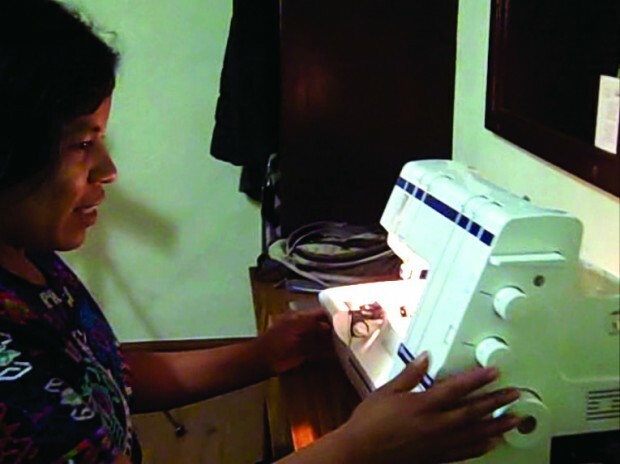 Back in Chajul, the lack of employment and opportunities for women forced her and her women friends to be inventive with creating work for themselves and working together to do it. In September 2011 they formed The Association of Displaced Maya Ixil Chajulense Women (ADMICH) which consists of 46, mostly young women under 30 years of age, and the association is led by 7 women from community of Chajul. The president is Magdalena. She wanted to meet me in person, she told me, because Jose had mentioned me. “Es un gusto conocerla.” It’s pleasure to meet you, I told her, and gave her my blank reporter’s notebook and pen. I told her that I promised to take notes and learn from her if she promised to do the same thing. We had much to learn from each other, our work and from others. The best way to remember was to write things down. She smiled and promised to write more. Even if it’s only numbers, you have to reflect on things you learn, I told her. She agreed. Magdalena knocked shyly on our hotel door. She and Jose walked into the room after traveling most of the day to meet us. Three buses and five hours later here they were in Xela, right outside our door. Night had set it and the rain had wet her huipil and long black hair she had in a pony tail that fell down her back. She didn’t mind, not the trip, not the rain, she was happy to see us, she said. We invited them in and I brought the box over from the desk and put it on the bed closest to the door. The box had the sewing machine inside, along with the manuals and dozen spools of string. Magdalena did not take her eyes off it. Open it, I told her. It’s yours. I handed her the box and the list of people who had donated to make it possible to purchase the machine. A big smile lit up her face and then she hugged Bea and I, a long warm hug that made me finally relax after our journey. I gave her the car keys and told her to use the ignition key to open the box. Bea filmed the entire nail-biting opening of the box until Magdalena took the machine out and expertly plugged it in. At first, she was careful, like a mother with her new child, not to drop it and to be gentle with it, but once it was plugged it, it was her machete. That night we all watched “Granito” together and the next morning, after writing “Thank You” letters, we set out early, even amid protests and blockades along the Inter-American. The rain and fog continued as Jose and Magdalena rode in the back of the truck and we kept the sewing machine in the small front cab, keeping it dry. We gave them our rain coats and drove past accidents, blocked roads, detours, fallen rocks, until we finally arrived at Los Encuentros and had our final lunch together. Afterwards, I handed the machine over to Jose as the rain came down harder and they rushed off to catch la camioneta which was just pulling up. They ran in the rain protecting the machine with some makeshift plastic bags ripped open. We watched as they made it to the back of the bus and waved back at us. The black smoke from the bus billowed out. Bea and I got back in the truck and headed home.